Requirement: To create a Node-Red flow on a Qnap NAS and it’s corresponding AWS interface. A series of IoT sensors transmit their values over MQTT protocol in JSON format. The Node-Red configuration must listen on port 1883, save the values in a local database and transfer the values to the Amazon IoT service. 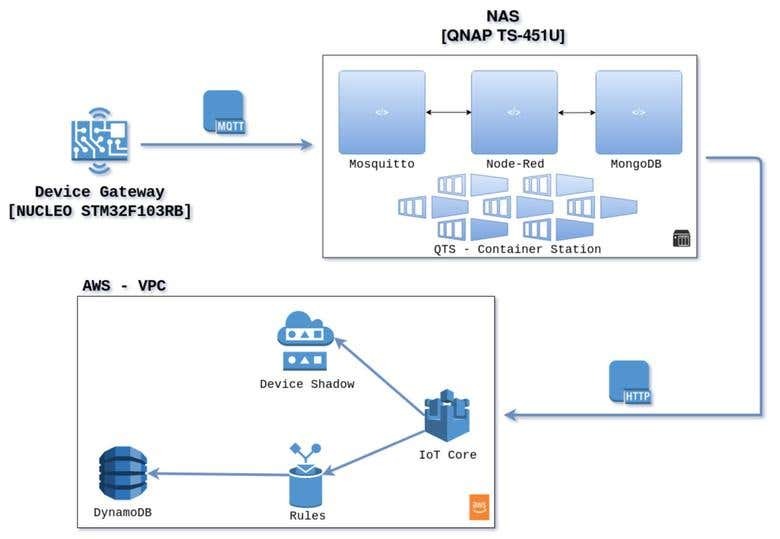 Design: The Device Gateway sends the sensor data over MQTT to NAS. NAS locally stores a copy of it and post the data to AWS VPC using HTTP based REST API calls. This data is then evaluated by set of rules and inserted into Thing’s corresponding DynamoDB tables. In addition, during this process, Thing’s Shadow is also updated with latest sensor values. P.S. : IoT sensors mentioned in this project are monitoring sensors used in a lake which are part of a Weather Station in Canada.